Leave what you think you know about studio cycling in the rear-view mirror & jump start your morning with an invigorating ride in our Sunrise Cycle class. Whether the goal is fitness training, weight loss or an alternative to cold, early morning rides outside, this class will challenge you to find your maximum pace. Welcome the “New Day” with a ride in a room exploding with music, energy, and inspirations at Club USA Fitness. Bikes are equipped with SOD clips on one side and baskets on the other. First 5 minutes of class will begin with proper bike setup. A water bottle is required, and a towel is highly recommended. All of our Schwinn bikes have computers now! You can tell how far you’ve ridden, how many calories you’ve burned, how much power (wattage) you can push, what actual gear you are in and how fast you are pedaling (cadence, RPM)! There is something for everyone in this Sunrise Cycle class – intervals, rolling hills, sprints, climbs and jumps, all to great energizing music. These hour-long classes will leave you feeling invigorated and ready to start your day! Always let the instructor you are new to class, so they are able to make sure you are properly set up on your bike to have the best experience EVER! Whether you are a serious cyclist or just wanting to burn some calories these are the local spin classes for you. We also have the MYZONE heart rate monitor system, so your spin class workout is up on the TV screens showing you where your heart rate should be during the drill and what the drill entails. You can purchase the MYZONE belt and watch at the front desk. 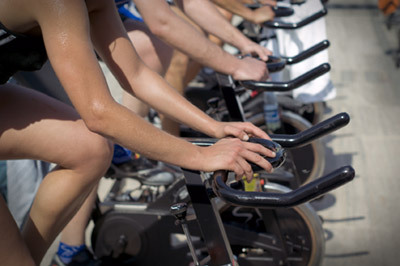 This Sunrise Cycle class starts at 5:25 am, so wake up, show up and get your day started in the best way ever…SPINNING! Contact us at Club USA Fitness today to get more information.